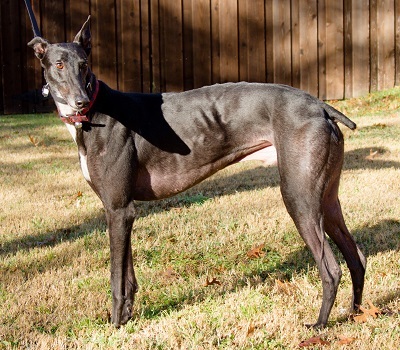 Butch is a 3-year-old black male born in 2014 - his litter tattoo is not clear. He was found abandoned at a motel in Decatur along with Cassidy. It is not yet know if Butch is cat or small animal tolerant. Butch is a handsome young man with a luxuriant set of long whiskers and an exceptionally long nose. He is on the small side but has a big, sweet personality. When awake, this gentle guy is Velcro. He will walk along in front of you and then stop across your path, so you must stop and love on him. He enjoys having his head cradled and his ears rubbed. Butch came in as a stray and was painfully thin. He also had an injured tail that had to be docked. He spent the first two weeks here sleeping and recovering from his time outside. Now that he has gained some weight and has caught up on his sleep, he runs in the yard and is enthusiastic about everything from playtime to meal time. He loves to toss squeakies in the air and collects them on his bed. Butch is well-socialized with people and animals. He is respectful and appropriate with the two senior females in my pack (read: he lets them boss him around) and gets along great with my senior Chihuahua. But he adores Joy, my five-year-old female, and loves to run the yard with her. Butch has proven to be a plug-n-play hound who already had house manners, including mastery of the doggy door, when he arrived. 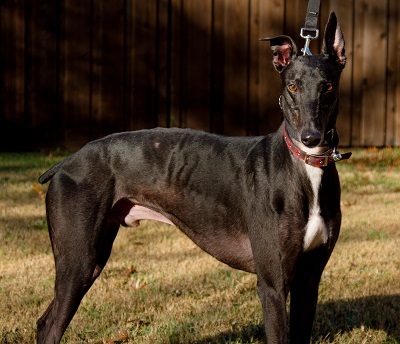 He’s going to make a great addition to an existing pack with his happy, gentle personality. He occasionally shows fear when I am rewinding the electric cord on the vacuum or when I tell him ”NO” when I catch him investigating the kitchen counters. For this reason, I think he would do better in a quiet home, or with a family whose children are a little older, where he can blossom in peace.